MIB’s conductor, Jo el Woods, is to present an afternoon of Classical Guitar reminiscing on his recent tour through Europe. 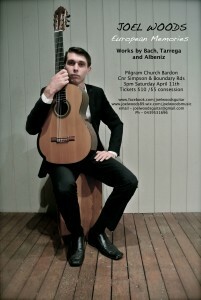 Woods featured as a soloist along with leading the guitar section of the Australis Ensemble tour through Germany and Bund Deutscher Zupfmusiker festival performances. After this festival, Joel continued solo to Barcelona, Spain, a country of great classical guitarists and composers. Barcelona amazed and inspired with concerts in the Paula de Musica, architecture by Gaudi and energetic street fiestas.